Public confidence in American criminal courts is at an all-time low. Victims, communities, and even offenders view courts as unable to respond adequately to complex social and legal problems including drugs, prostitution, domestic violence, and quality-of-life crime. Even many judges and attorneys think that the courts produce assembly-line justice. Increasingly embraced by even the most hard-on-crime jurists, problem-solving courts offer an effective alternative. As documented by Greg Berman and John Feinblatt--both of whom were instrumental in setting up New York's Midtown Community Court and Red Hook Community Justice Center, two of the nation's premier models for problem-solving justice--these alternative courts reengineer the way everyday crime is addressed by focusing on the underlying problems that bring people into the criminal justice system to begin with. 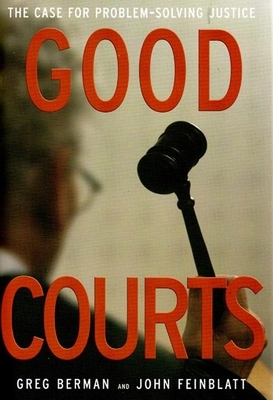 The first book to describe this cutting-edge movement in detail, Good Courts features, in addition to the Midtown and Red Hook models, an in-depth look at Oregon's Portland Community Court and reviews the growing body of evidence that the problem-solving approach to justice is indeed producing positive results around the country. Greg Berman is the director of the Center for Court Innovation, a think tank that works to improve the performance of state courts and criminal justice agencies. John Feinblatt is the Criminal Justice Coordinator of the City of New York. They both live in New York City.